So simple and so true, that if we repeat affirmations and seed words often enough and take action, things begin to happen. The subconscious mind, on a deep level will register repetitive affirmations and words as true and will support you in creating what you want. Whether we are trying to create something new in our life or eliminating something unwanted from our life ~ Affirmations work. 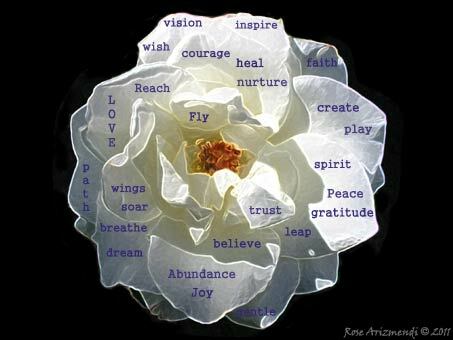 I created the affirmation collage above using the archetypal image of the rose, a symbol most often associated with the heart chakra, the Divine Feminine and mystery. I then added words that have special meaning for me using Photoshop. There are so many wonderful artists and storytellers weaving their magic on the web these days that it would be next to impossible to cover all of them in one post. So here are a few of my favorites . . .
Katherine Langrish’s ~ Seven Miles of Steel Thistles blog ~ serves up a bountiful feast of faery lore and literature, as well as a wonderful post on water folklore. 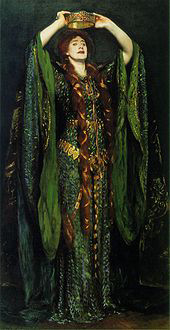 The Victorian actress Ellen Terry wore a dress made of iridescent beetle wings when she portrayed the Lady Macbeth at London’s Lyceum Theatre in 1888. The famous emerald and sea green beetle wing dress has now been restored and returned to its home, Smallhythe place in Kent. Smallhythe Place was the home of the Victorian actress from 1899 to 1928. Be sure to check out Virginia Lee’s Painting, Three Hares Tor, on her lovely art blog. The triple hare motif has always been one of my favorites. Love it! Over at the website of The Company of the Green Man Blog, you will find all kinds of information, images and folklore about the green man. Sue Blackwell ~ an extremely talented artist with a unique vision. 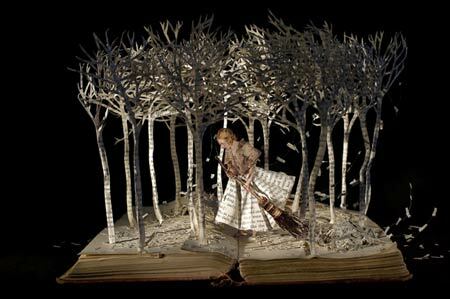 Step into the realm of fairy tales and folklore and explore the magic she creates with her series of book-sculpture. Breathtakingly beautiful! Midsummer is a time to celebrate the power of light and also a time to show our gratitude for our Mother Earth. ~ We have a beautiful mother, so precious this small blue planet that we call home and we need to take better care of her. 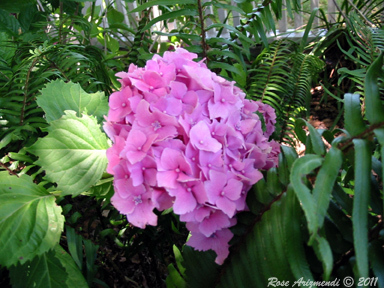 Today the earth is in full bloom, alive with ripeness, abundance and the sweet promise of the harvest to come. We gather together with our friends and family to celebrate the warmth and fulness that the summer season has to offer us. So many things to be thankful for ~ the laughter of children ~ breathing in the sweet scent of flowers ~ fresh vegetables from the garden ~ collecting lavender buds ~ warm sunshine kissing my face. Folklore tells us that on this day the veil between the human world and the fairy world becomes as thin and delicate as a spiders web, with the veil between the worlds becoming even thinner on the third day after Summer Solstice. Making it much easier for humans and other beings to journey back and forth between the realms. 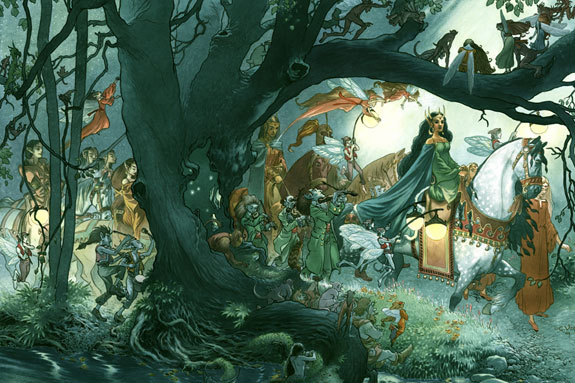 It is also believed to be of great importance to leave offerings of milk and honey for the fairy folk to honor their presence in the world, so as to promote harmony between us. Some even claim that all magical work becomes more potent on this day. 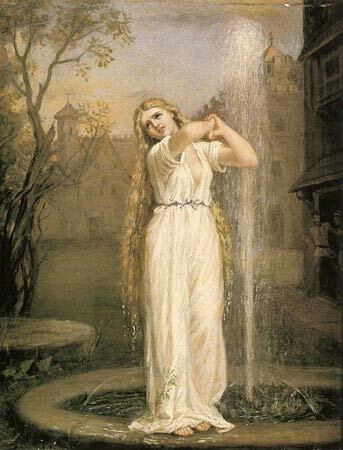 Even today, many believe that fairies are simply nature spirits and therefore as ancient as wind and rain. 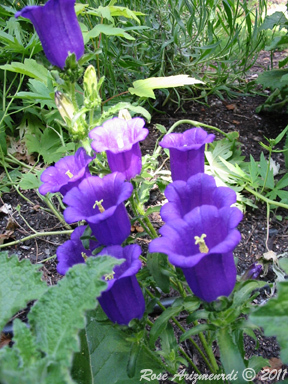 In this view, they’re the manifestations of the living spirit in all organic matter. The Penguin Dictionary of Symbols, mentions that fairies seem to have originally been emanations of the Earth Mother that subsequently became water and vegetation spirits, appearing frequently on mountains, in woods or forests, or near water~courses. It matters not whether you believe or not, our fascination with fairies will most likely never fade away. The folklore and myths surrounding fairies has been with us for centuries and will likely continue on as long as mankind walks the earth. Greetings & Blessings to all on this beautiful Sunday morning. With only two more days til Midsummer Eve, here is a song from Loreena McKennitt.